First of all what is the definition of a foreign corporation as far as United States taxation is concerned? A domestic corporation is a corporation or legal entity organized under the laws either of the United States or one of the states of the United States. Pursuant to 26 U.S.C. Code Sec. 7701(a)(4) and U.S. Treasury Regulations Sec. 301.771-5(a), a foreign corporation is a legal entity organized under laws other than U.S. law or the laws of one of the states of the United States. For examples, corporations organized under the laws of Brazil, or Mexico, or Germany, or Sweden, or India or China would be foreign corporations. There are special tax rules that apply to corporations or legal entities organized under the laws of Virgin Islands, American Samoa and a couple other U.S. interest that are not one of the 50 states of the United States. This blog does not discuss these special rules in detail. What difference does it make whether a corporation is domestic or foreign? The threshold question is whether the foreign corporation is subject to U.S. income tax on its income, gains and losses. The answer depends upon whether the foreign corporation is engaged in business within the United States. Is the foreign corporation engaged in business in, say, Guam or any of the 50 U.S. states? Business income, gains and losses for a tax year is subject to the same graduated income tax rates that apply to domestic corporations if that income, gains and losses are effectively connected with an U.S. trade or business. According to 26 U.S. C. Code Sec. 882 (a), a foreign corporation engaged in business in the United States has effectively connected income, gains or losses. 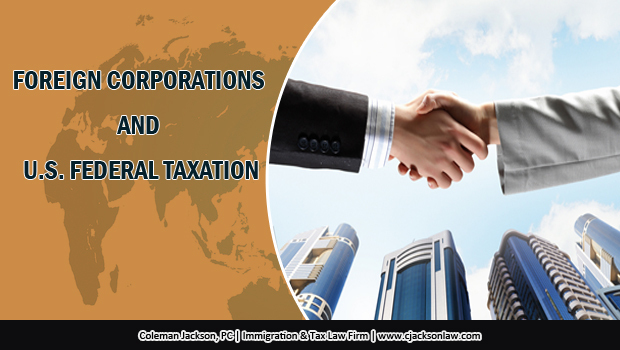 Each tax year the foreign corporation must determine whether it is subject to U.S. taxation because the effectively connected income, gains or losses test must be performed each tax year. Notwithstanding the last sentence, a foreign corporation’s income, gains and losses for subsequent tax years are ‘on first impression, or generally’ treated under U.S. Treasury Regulations §§ 1871-8(c)(1) and 1.882-1(c) as effectively connected income, gains and losses if the foreign corporation is engaged in business in the U.S. in the subsequent years even though the income, gains or losses in the subsequent years are not effectively connected with a trade or business in the United States in the subsequent years. The method of accounting utilized can have significant impacts with regards to the taxation of foreign corporations under U.S. Treasury Regulations §1.871 and §1.872. That means that if a foreign corporation uses the accrual basis of accounting method or some other method of accounting where income, gains, losses or expenses are constructively received or deferred from one year to the next- the use of such accounting principles- could subject a foreign corporation to graduated taxation on its effectively connected income, gains and losses. When evaluating whether a foreign corporation is engaged in business within the United States, the corporation must do its due diligence to assess any and all of its affiliations, associations, partnerships, joint-ventures or other activity with any entity or person within the United States whether it be a nonresident alien, domestic trust, domestic corporation, domestic limited liability company or similar domestic business entity organized under the laws of the United States or any of the 50 states of the United States. United States tax laws apply strict assumptions (truth deemed to be self evident) where a foreign corporation has requisite ties to a domestic entity engaged in business within the United States, such as, any of those types of entities listed in the previous sentence. Foreign corporations must perform this ‘effectively connected income, gains or losses of foreign entities’ evaluation and determination each tax year. This blog is written by the Immigration & Tax Law Firm of Coleman Jackson, P.C. It is for informational and educational purposes and does not create an attorney-client relationship between this law firm and the reader. If you have questions about your particular situation regarding federal or state taxation or entity structuring matters or immigration matters, you should consult with independent legal counsel with respect your individual situation or circumstances. This entry was posted in Taxation on September 15, 2015 by Coleman Jackson.